LazyDbBackup is based on LazyBackup by Stefan Granholm. (GNU/GPL 2 or over license). This plugin was modified to run with Joomla! 1.6 and internationalised. It comes now in three languages: English, French and German (many thanks to Nathalie Laurent from www.n-at-work.net for this german translation). And now Spanish language for version 3.0 by Jorge Ferreira from jorguito.com and Italian language by Giovanni Roli (see below). Its purpose is to backup your Joomla! 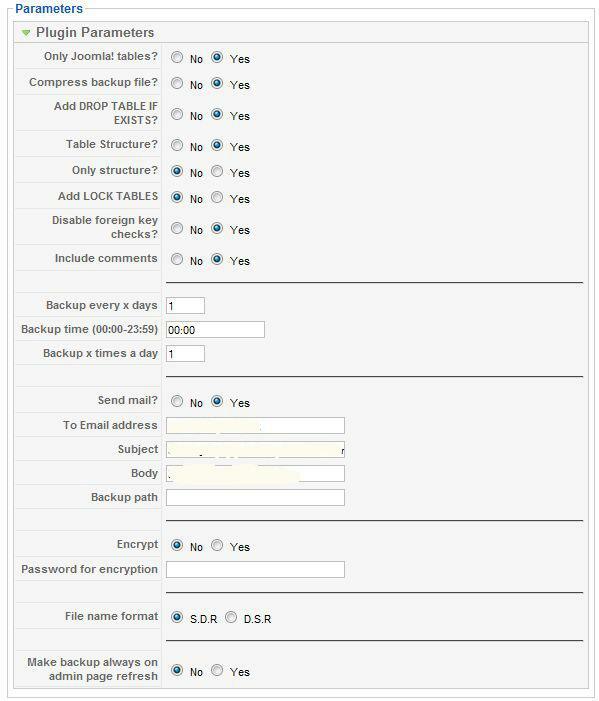 MySQL database and send the backup file by e-mail. One parameter allows you to deactivate the e-mail feature; the backup files are then kept in a special folder which you can download by FTP when needed. New 30/06/2013 : new version 2.5 3.0 and 3.x compatible including Italian translation by Giovanni Roli. Many thanks to him ! March 25, 2016: some servers don't allow to use MySQL, only MySQLi or PDO, so there are two versions of LazyDbBackup using MySQLi or PDO (both for Joomla! 2.5 and 3.x). Prior test the PDO version. Both allow now to not delete backup file after mailing it. Don't forget to delete older files from time to time or use LDBChecker (please see below). If they are errors, please try MySQLi version. July 8th, 2016: added dutch translation to 3.5.2. Thanks to Eric Swimmer! April 12th 2017: versions 3.7.0 compatible with Joomla! 3.7, JRequest, "deprecated", replaced. Slovenian translation by Ervin Bizjak added. Thanks to him! Install it with the standard Joomla! extensions installer; you only need to set the appropriate parameters and activate the plugin. this is what sharing is about, helping each other and make it free for all .Very good day to you.